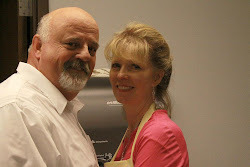 Tony & Lorna DeRoest Family Blog: The close of another chapter in life. I have such mixed emotions of the changes that are in store for me. After 3 1/2 years of once again being the Young Women's President at church, I was released last Sunday, and had our final program of New Beginnings on Wednesday evening. It was a time to get the girls excited about the new theme of the year, tied into the encouragement of them becoming the girl of there dreams. 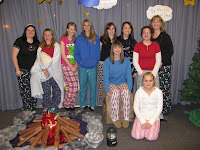 We had an outside campfire setting with all in their pajamas. 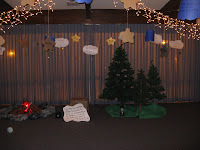 The ceiling had stars & clouds hanging from it with quotes of encouragement. The new YW presidency participated in a portion, so that they could be properly introduced, since it is their New Beginnings also. I realize that I have had many opportunities to direct these girls and with all the grand babies, my focus is truly changed. However, there is also a feeling of being disconnected from everyone. I'm sure this will soon pass. In the mean time my goal is to focus more on being a better wife, mother, grandmother, and become more spiritually prepared to meet my Savior. I have a long way to go I'm sure. Oh Mom, congrats and condolences on this news! I know that you'll be blessed for your service and am glad that you've been given a little more time to focus on your family too. Love and hugs from Texas! I'm glad you're free for family as well. It sounds like you made some great memories right to the end. Disconnected in one area allows you to be more connected in another. The fire looks good! I love you dear, and hope to be a better whatever in your life.